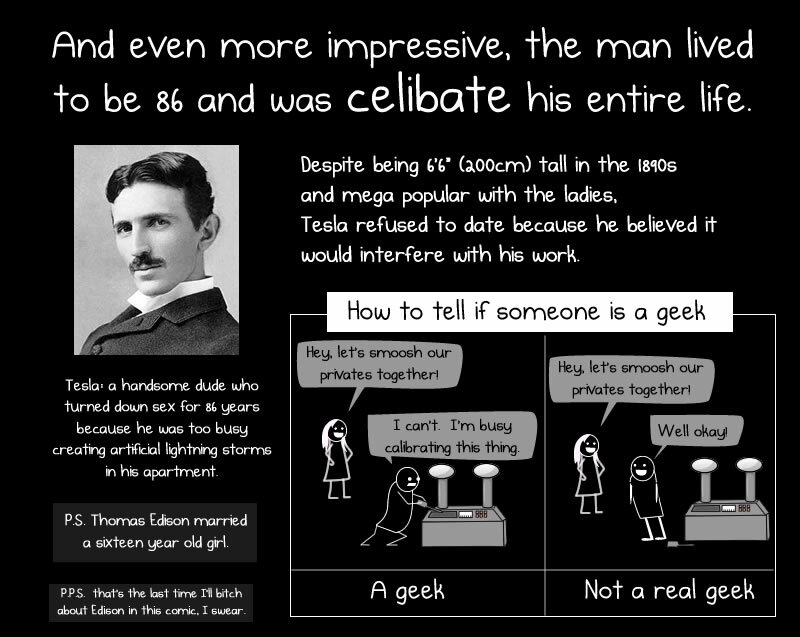 Also, this Badass of the week by Ben Thompson is what originally inspired me to write a comic about Tesla. Ben’s also got a book out which is packed full of awesome. There’s an old movie from the 80s on Netflix Instant Queue right now about Tesla: The Secret of Nikola Tesla. It’s corny and full of bad acting, but it paints a fairly accurate depiction of his life. Cryogenic engineering: I’m referring to the cryogenic engineering that has to do with using liquified air to cool a coil and reduce its electrical resistance (Patent No. 11,865), not freezing people and waking them up in the future so they can fight Wesley Snipes. 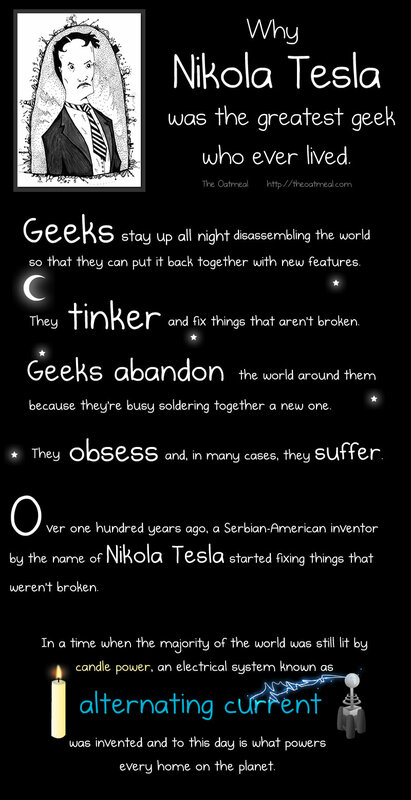 Radio: Tesla was the nicest geek ever until he decided to sue Marconi a few years later. 8 months after Tesla died, the U.S. Supreme Court overturned Marconi’s patents on the invention of radio. 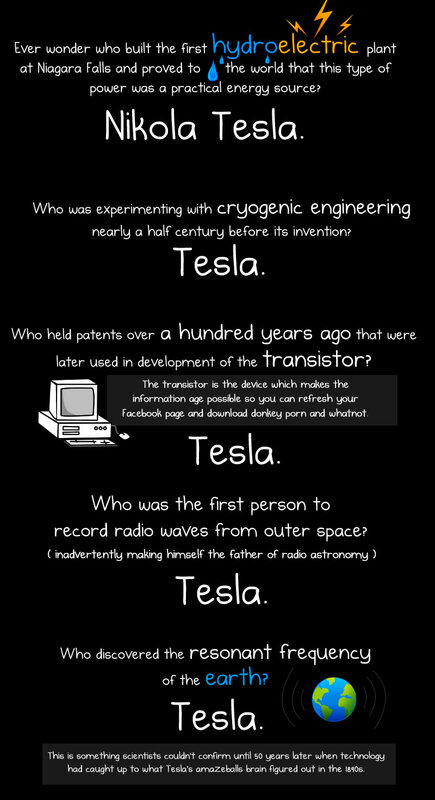 So Tesla eventually won that battle, although he was dead by then. Tesla VS Edison: I could write a novel on the differences between Tesla and Edison, but seeing as how this comic is already huge I decided to leave many things out. For instance, Edison killed cats and dogs, but Tesla loved animals and had a cat as a child. Originally Tesla wanted to be a poet, but after getting zapped by static electricity from his kitty he was inspired to study the effects of electricity. One could vaguely construe that Tesla’s cat was responsible for the second industrial revolution, which arguably makes it the most awesome cat who ever lived. Edison believed that fossil fuels were the future and that there were enough resources in South America to provide for the next 50,000 years. Tesla believed that renewable energy sources like hydroelectric, solar, and wind power were the future. This is remarkable because in the 1890s there was no such thing as “going green,” so Tesla’s ideas on conservation were very forward-thinking at the time. 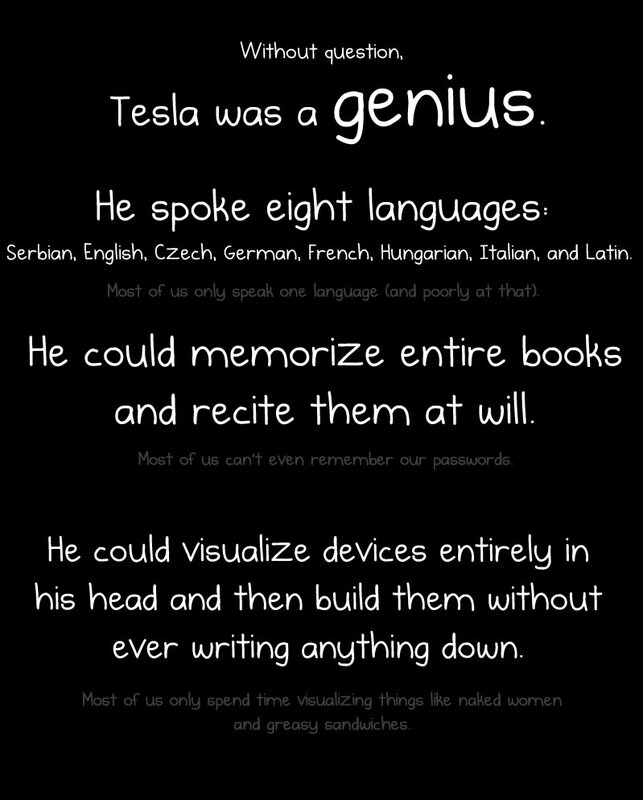 Nikola Tesla, literally Tony Stark in real life, reminds us that visionary, multitalented geniuses can and do exist. Nikola Tesla Day, July 10, also happens to be my birthday. Sometimes I imagine I get to give him a high five.